As background, Amazon Fresh is an additional service you can subscribe to (on top of Amazon Prime) in supported areas where an additional monthly fee gets you into the program, then orders over a minimum amount ($40 for me) gets you free delivery. So it is not an effective program for buying small quantities. The idea of Fresh is it more targeted at your weekly grocery shopping trip. 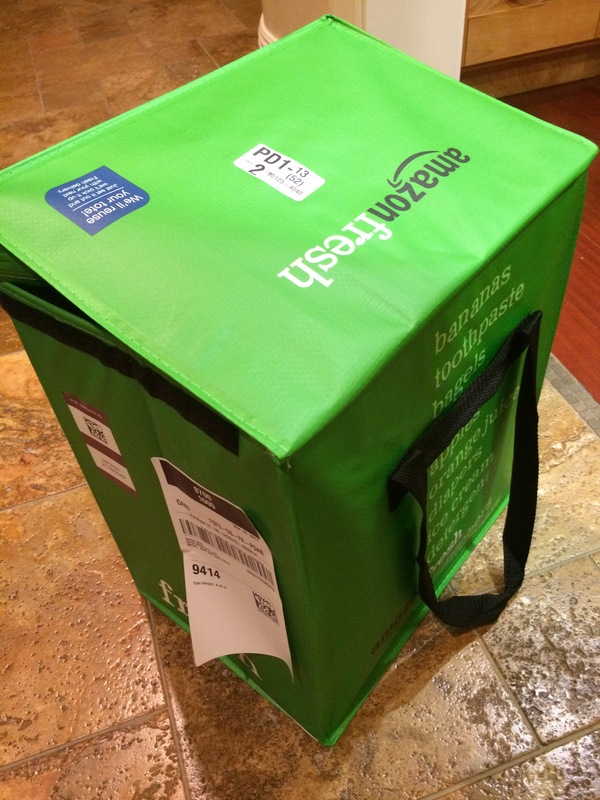 Enrollment to Amazon Fresh was pretty easy and painless. It was interesting however that it encouraged me to immediately register my preferred time of deliveries. I declined initially (I wanted to understand Fresh better first), causing it to nag me numerous times through my experience. I am guessing Amazon wants to collect the data about delivery patterns from as many users as possible, otherwise it could have waited until checkout. My first experience however was rather confusing to get stuff into my first cart. There is Amazon Prime, Amazon Pantry, Amazon Fresh, add-on products, and more. This often confused me in terms of navigation. (More on this later.) My first order was really to get enough into my cart to purchase the Amazon Dash Wand(a voice control and bar code scanner device). Ordering without being subscribed to Amazon Fresh came up with “sorry, product not available yet”. Once I got the dash wand in hand (the morning after ordering! ), my next challenge was to get it working. I tried on my wife’s iPad, but the setup instructions in the box basically said to use the app and get the instructions there. That would have been fine, except the app crashed as soon as I got into the relevant area. Turned out the iPad was still on iOS 9 – upgrading to iOS 10 addressed the issue. (Glad to hear it is not only Magento having backwards compatibility problems!) But trying lots of options here wasted 30+ mins of my time trying to work out why the app was crashing. The Amazon ads I had seen had seen has a person looking in the fridge saying “apples”, “strawberry yogurt” etc. to the wand. So I tried that. Nothing appeared in my cart. After a while I realized it had put them into this special area (on my iPhone). It was asking “what does ‘apples’ mean” – e.g. what type of apples, what quantity, etc. I have not used it long enough yet to work out if it will learn my preferences, or whether each time I use voice I have to review the list on my computer afterwards. So my first experience of voice with the device was not particularly compelling. If the device does not learn my presences, I will probably give up on using voice. It did not remove total effort for me – scanning bar codes was much more precise. This step reminded me of relocating to the US from Australia. There were lots of similar brands in the supermarket, but there were more different than same. It took a while of product experimentation to work out the good from the bad brands. I suspect this will be the same with Amazon Fresh, just as it is true for moving to any other different supermarket chain. So when I talk about products not being found below, that does not mean there are not other alternative products available on Amazon. It just meant they did not come up with low friction. One interesting thing also was I found the same product (such as Ovaltine) was available in different sizes. When going to my local supermarket, I often picked the best size to give me a better discount. It felt like there were fewer size options on Amazon Fresh. But given all the extra costs of home delivery etc, maybe the few cents saved really are not that significant with the benefits of home delivery. Having got the dash wand (bar code scanner), I was curious to see how much of my typical weekly purchases were on Amazon Fresh. So I grabbed the wand and scanned my fridge and pantry contents – as many bar codes as I could find. 7 items the scanner said “I don’t know that item – please tell me what it was”. Implied in this was there were many products that were not available on Amazon, but Amazon still knew the bar codes for and tried to suggest alternative products based on the product description. It found 26 Amazon Fresh products correctly, 15 were grouped under Amazon Fresh but noted as not available with acceptable alternative product suggestions, and 18 were not present and the suggestions were not acceptable (I would not have bought them). Interestingly, quite a products were found in Amazon Prime. 25 were listed as Amazon Prime products (including instant noodles! ), 10 it made acceptable alternative prime product suggestions, and 8 bar codes it did not make reasonable suggestions on. The experience was a bit confusing really – Fresh and Prime feel like different product areas, but not all the food products where available in Fresh. One interesting thing was Ovaltine was available on Amazon Prime and in Amazon Pantry. The pantry option was much cheaper, but the wand did not pick it up. It added the Amazon Prime product instead. I did not check all the other products. I did not actually check out, but it was a concern. So what about other supermarket chains? My local supermarket is Safeway. Safeway has a home delivery app that includes a barcode scanner using the camera. So why not use that? I found that it had some problem scanning items in my cupboard, but probably the biggest issue was the extra friction of opening up the app. 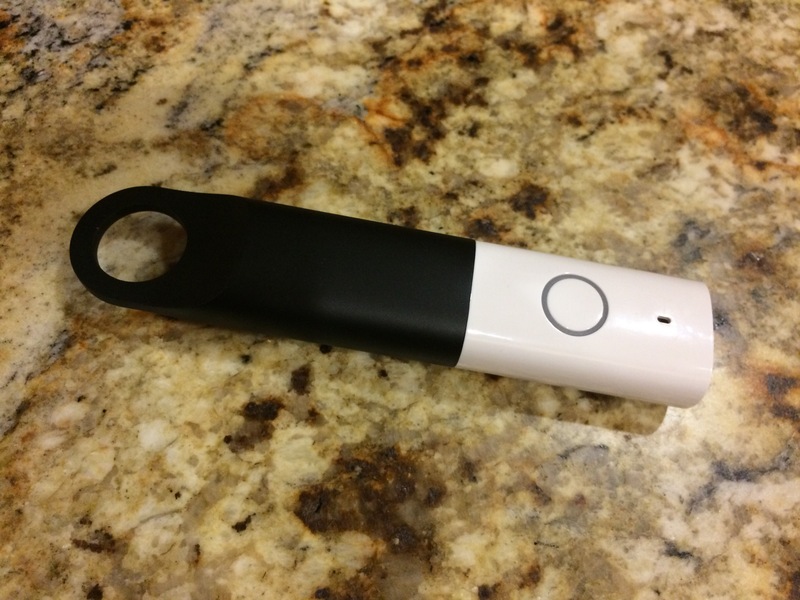 The Amazon Dash was so easy to grab, point, and click to scan the bar code to add to my cart. It was very quick. The app approach took more steps – unlock phone, open app, click “scan” button, try to line up the camera with the bar code, etc. The dedicated device was more convenient. All up, it was interesting to see that the experience was pretty good, but certainly not perfect – even for Amazon. Around 47% of the products in my cupboard it found by scanning the bar code (although only roughly half in Amazon Fresh). That goes up to 70% if I include alternative product suggestions that it made. Not bad, although it implies almost 1/3rd of products in my fridge/pantry I did not easily find on Amazon. It was also interesting to see such high percentage of products still in Amazon Prime rather than Fresh. This was a problem in some cases, as it might be a set of 10 products in a bigger bulk purchase that I would have had to buy. Is this a criticism of Amazon Fresh? No, not really. I am sure they will expand inventory over time, and as I said at the start changing to a different supermarket chain you expect to talk a little while to work out the products available in that chain. Will I stop using my normally supermarket in favor of Amazon fresh? That is to be determined. I like selecting fruit and vegetables by hand, so I suspect it won’t replace it completely. And if not completely, only time will tell if the complexity of split purchase experiences will be worth it. That is, if I am going to the supermarket anyway, why not get everything in one hit. What was also interesting was how confusing the Amazon Prime, Amazon Pantry, Amazon Fresh, etc experiences were. I often found myself lost. Going to amazon.com, I had to remind myself how to get into the “Fresh” experience. But all up it was interesting to see how much Amazon was not a perfect experience. But they are clearly trying and learning as they go.